I am already in Penang for half a year. Many good things had happened since I moved here. I am happy and had even gained a few kilos due to the good life I am going through right now. I mean really right now. Although I seldom blog since I'd move to Penang but I do occasionally still update my technical blog. Now, I just want to share a few pictures of my few new days when I arrived in Penang. My cubicle opposite is a big rock! My wife's first hand drawing... hmm... what do you call this? Vincent : Having a good life here right, fei yao? It's the CNY!! Always love to hear all this typical words, sound, atmosphere and the hype of it. Greetings to all out there. 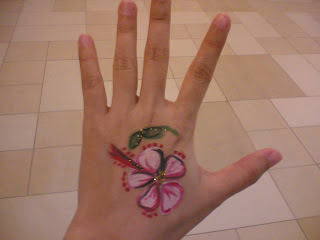 Went to SGM CNY Celebration. Started with a bad MC and falling down the mood with some speeches from the elders. Almost felt asleep but was arouse with the new programe when it started with a new MC when he called himself, Cheung.. Kong... 7... brother, CJ9. It was fanstatics with a few performance including short stories, singing and finally some good acrobatic performance. Morning with some big prawns. And started with a PS2. Second day still in progress. To those chinese or non - chinese who are celebrating CNY which stands for Chinese New Year. ISTL co - author here to wish everyone a properous CNY and a happy 2008 and also Happy Mouse Year. Eh? You got a question? Your browser can't see the don't list? Well too bad for you... Actually there isn't don't do list. Just do it... It's your year man, so why hesistate? As long as it's ethical, positive and not against the law, what's keeping you? Just be happy, cheerful and positive! A, B and Me was in a living room. A: Ei, B do you want the music I downloaded? B: Yea sure, but I can't see your file sharing. A: B, you can see Me's sharing folder right? Me: Dude, come on lar, you can share with B and you can't share with me? Since you putting there why need to cut it away? When we are little kid, our mum or dad forced us to read kindergarten book or children book. I remember I used to read Peter and Jane, it went like this "This is peter and this is Jane. This is Pat, the dog." So now, let me introduce you in such a way, "This is Patrick and this is my hand." 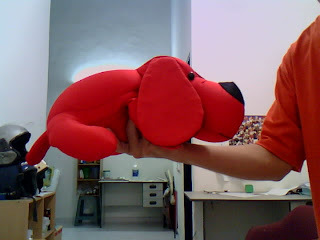 Say "Hi" to my new dog to accompany my friend. Isn't it cute? Eh, actually it's quite obedient too and it doesn't eat, sleep or dump any faeces around your house or better, doesn't make a mess at your furniture or bite the postman. One thing for sure, it doesn't even bark. But it's really nice to hold at it. Upon paying the bill for the meal, my friend looked at my wallet, and heard a loud echo sound beaming back at her. Both of us smiled. "I shall say that we should declare bankruptcy for today!" My friend quickly stopped me, "Nope, look we still have some!" and she brandished out some leftover cash. Recalculating how much left, we agreed that we could still go for a movie. Looking and sneaking around at the cinema for a decent movie with a decent time, we found one. As we pay for the ticket, the empty echo sounded again. This time my friend looked at me again and I smiled back. "I shall say that we declare bankruptcy for the second time!" This time my friend couldn't disagree with me and tag along to the cinema..
Later, my friend went to "rob" the ATM for some cash but not long, my friend stumbled upon a very nice clothing. Not too long, she hurried to the counter and used the money. This time another empty echo sounded from my friend. "I shall really say that we declare bankruptcy for the third time!" My friend laughed at me. How many times can one go broke in a day? It's a holi-holiday season, and someone is coming to town. The so-called man is called Santa Claus. Merry Xmas to all and have fun admist some countries who banned it. Well, it's still worth to celebrate and enjoy and be happy. No harm in getting yourself the happy mood. Cheer and Ho! Ho! HO! Alrighty, I am moving up north today. The fate of Is Sky The Limit : Episode 3 will be decide again at a later date. Is Sky The Limit : Episode 3 has been running for almost 3 years now and to stop it would be a very sad thing for my silent readers. co author : eh... your blog ada orang baca ka?. Nevertheless, I know some of you out there had thought that my blog is no longer active. Given the fact, I hardly submitted many entries for half past year. Anyway, I would like to take this opportunity to tell all of you in Kuala Lumpur to be happy with everything (including price hikes!). I will be settling down in Penang today. Oh god... I need to go back to gym! - and my sweat like a pig... damn! This justify one thing - I NEED MORE EXERCISING! is sky the limit... i need to exercise more... more... MORE!